Military vehicles carrying DF-26 ballistic missiles drive past the Tiananmen Gate during a Sept. 3, 2015, military parade in Beijing, China. (CNN) - Chinese state-run media has offered a pointed defense of the capabilities of its so-called "Guam killer" missile, challenging an earlier CNN report that doubted its ability to hit moving ships at sea. A slickly produced short video touting the missiles' advanced technology was first televised in China on Thursday. This was followed Monday by a series of articles backing up the claims made in the video that the missiles can hit an aircraft carrier. The media push appears to be part of a concerted propaganda campaign designed to impress domestic audiences while underscoring China's military strength on the international stage. Experts say the release of the video, which purports to show DF-26 intermediate-range ballistic missiles being launched from an undisclosed location, actually reveals very little. "The video doesn't show a missile hitting a moving target at sea," military expert Carl Schuster told CNN. "For all the audience can see, it is a standard ballistic missile launch with no indication of whether the target is moving or static." China has long claimed the missile, dubbed the "Guam killer" by analysts for the threat it poses to key US military bases on the Pacific island, can also target warships in the open ocean. The DF-26 is believed by US analysts of being capable of hitting targets up to 3,400 miles (5,471 kilometers) away with nuclear or conventional warheads. But hitting a moving target at sea would require practicing procedures and tactics that China had not yet shown, said Schuster, a former director of operations at the US Pacific Command's Joint Intelligence Center. After a US Navy guided-missile destroyer steamed near Chinese-claimed islands in the South China Sea earlier this month -- an action Beijing claimed violated China's territorial waters -- China said it had deployed the missile to its remote desert and within range of the South China Sea. 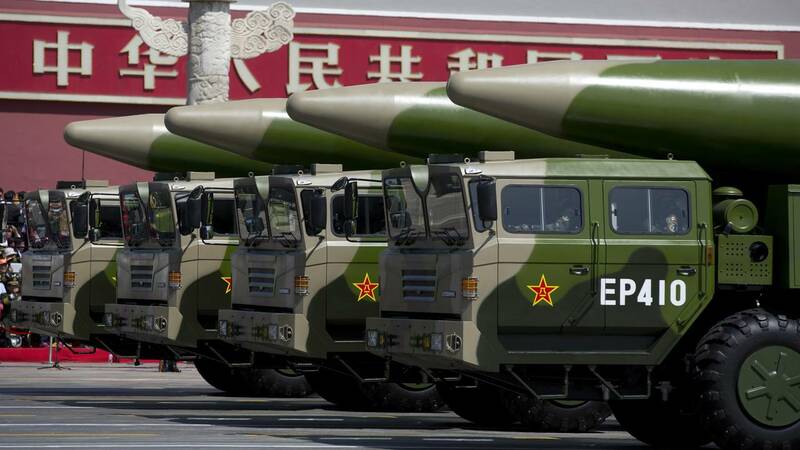 A second report carried in Monday's pro-government Global Times claimed the video from state-run China Central Television showed the DF-26 are equipped with four fins near the nose of the missile. This, according to the report, allows the missile to change course in flight to hit a moving ship. "The special design enables the missile to accurately control the attack trajectory, as the four flight control surfaces provide super maneuverability and guide the warhead during the terminal stage to hit a slow-moving aircraft carrier," said the report, citing Chinese military expert Song Zhongping. The report quotes another unnamed Chinese military expert as saying the missile's warhead was electronically linked to a targeting system. "An information network connected to the warhead, which possibly includes satellites, ground and naval radar in addition to radar on the missile itself, will constantly update the location of a moving target, informing flight control where to guide the missile," the report quotes the anonymous expert as saying. The Global Times report, which references CNN's previous story, concludes by saying the video provides an example of practiced launches. But Andrew Tate, an analyst at specialist military magazine Jane's Defence Weekly, said proof of the DF-26's anti-ship capabilities would require more testing. "The Global Times report refers to the missile's own radar, which may be required for the terminal homing phase, when any delay in updating the target position could result in a miss. Assurance that this functions as designed would require representative trials," Tate wrote after reviewing the video clip. Schuster said the video of the missile tests indicated doubts about the abilities of the truck-mounted weapon expressed in earlier CNN reports were warranted. "Your (previous) report was on target and they feel they have to counter it to achieve their strategic messaging and domestic propaganda goal," he said. "The video is beautifully done with dramatic music and effect, but it doesn't show the missile hitting a target of any kind." Since the beginning of January, articles across state-run media outlets have highlighted new weapons claims, military recruiting efforts and the expanding global role of the People's Liberation Army. On Friday at a meeting of the country's powerful Politburo decision making body, Chinese President Xi Jinping stressed that the Communist Party needed to strengthen communication across a range of fronts.